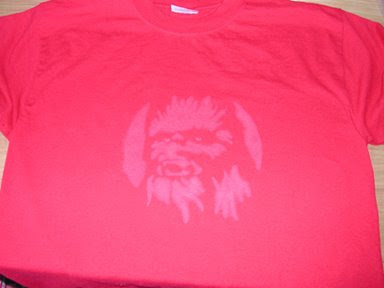 I got an elaborate pumpkin/Halloweend stencil of Chewbacca–who happens to look a bit like Bigfoot in this photo–and used a bleach pen to trace it in and fade out the red dye of the t-shirt. I gave this to my stepbrother for X-mas a couple of years back. It was fun to make.